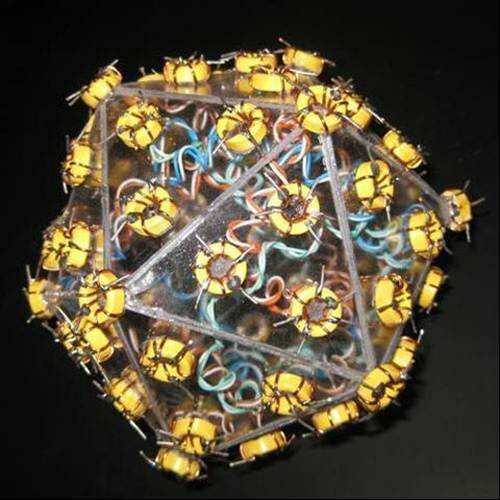 This sculpture represents the HIV virus, which is one of several types of viruses that have an icosahedral shape. The materials used in this sculpture include polycarbonate for the membrane, inside the membrane are the wires from CAT5 cable representing DNA strands. The 72 nodules that cover the surface are similar to the toroidal inductors found in PC power supplies. Computer Weekly has covered the devastating human impact of toxic technology waste, but sculptor Forrest McCluer has found a way of using computer parts creatively. The self-replication characteristic of biological viruses led security researcher Fred Cohen to coin the term "computer virus" but McCluer brings a new twist to the term by constructing 3D representations of biological viruses using old computer parts. McCluer's project to deconstruct 30 discarded PCs and create a variety of sculptures from all their parts is documented on his website.